Longtime readers know my connections to zoetropes — inventing new types of them, starting business based on them, making art with them, etc. A longtime friend from school contacted me for the first time in years with news that her son is doing a project on zoetropes for his fourth grade science fair. Check it out! The pictures show he did the most important thing in science. Or for that matter, life, if you ask me. He did the thing he was interested in. Actually, I suspect he did it a couple times because the quality of his zoetropes looks better than the ones I make by hand, as best I can tell from his pictures. About 180 years ago someone else built one and played with it. After many intervening steps, as a direct result, you have movies, YouTube, and the ubiquitous animation of today’s world. Today it’s hard to imagine a world with no animation. Maybe my friend’s son will take this experience building and playing with something to make something that someone 180 years from now will present in a science fair too. I see a blue ribbon in the upper corner too. And my name in the page on linear zoetropes. I’m honored and flattered. 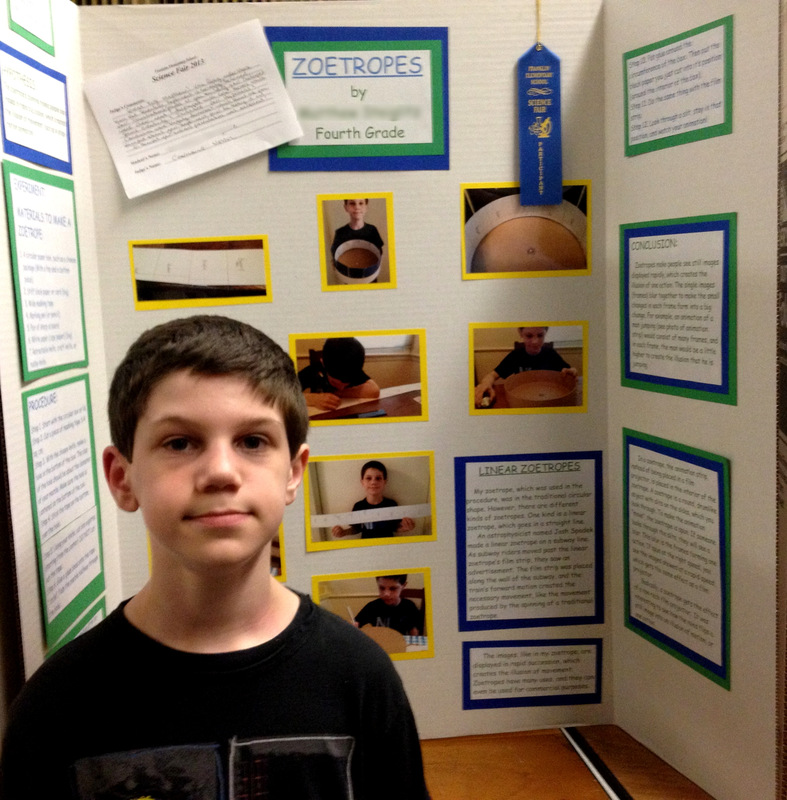 I really enjoyed this posting about zoetropes in the science fair! It’s incredible what you have done with linear zoetropes. Wait till you see what comes next! Working on some cool projects.